Clouds. Albert W. Barker. 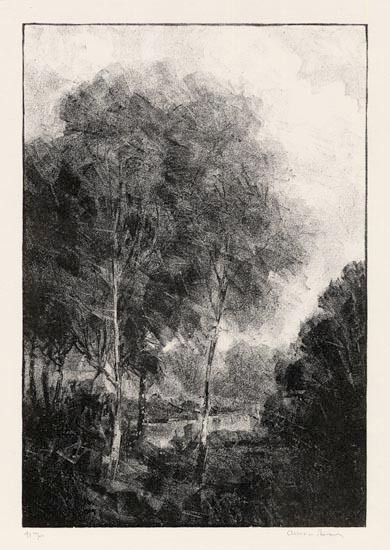 Charcoal drawing, 1920. Image size 9 7/8 x 13 15/16″ (252 x 355 mm). LINK. Today we are exploring the work of artist Albert W. Barker (1874-1947). A resident of Rose Valley, Barker’s scenes depict the farmlands of southeastern Pennsylvania through loss of farmland, early industrialization, and the Great Depression. Barker was born on June 1, 1874 in Chicago. 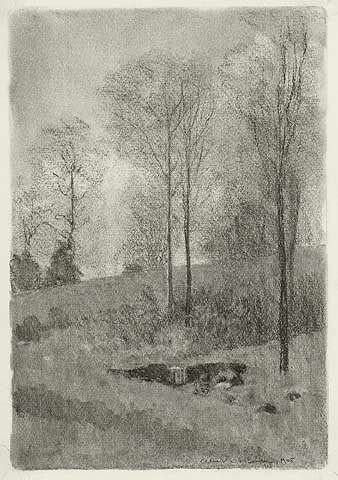 In 1890, Barker began classes at the Pennsylvania Academy of Fine Arts, where he studied charcoal drawings, as well as met his future wife Bess Morot. From 1903 to 1913 he taught at the School of Industrial Art in Philadelphia, before returning to study at the University of Pennsylvania. A lover of the classics and archaeology, in 1921, Barker received his Ph. D in Greek archaeology. 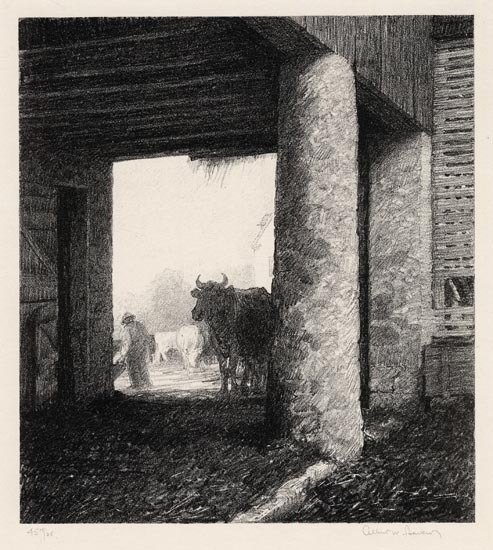 Barker’s early charcoals and lithographs are predominantly landscapes, sometimes dotted with barns or early farm equipment. 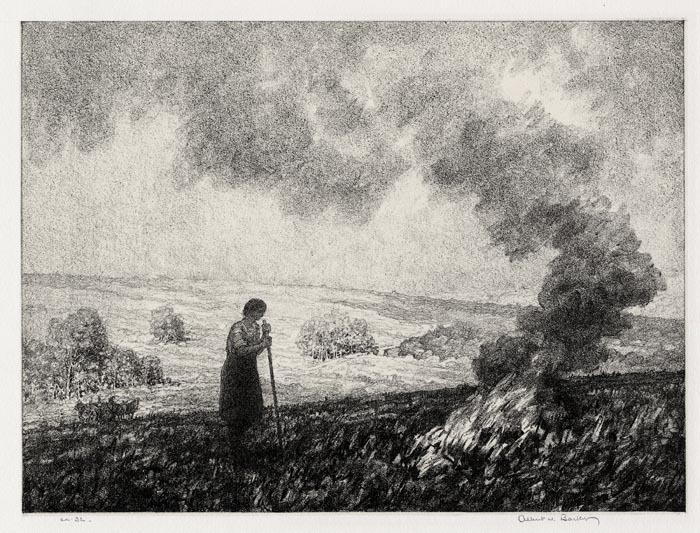 By the mid-1930s, his prints include portraits of the farmers and workers of the land he loved so much. 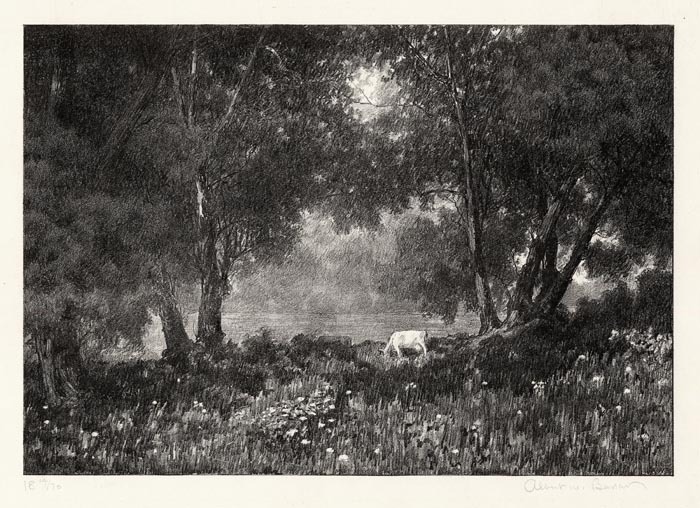 Not limited by his stark black and white palate, Barker instead filled his prints with atmosphere. 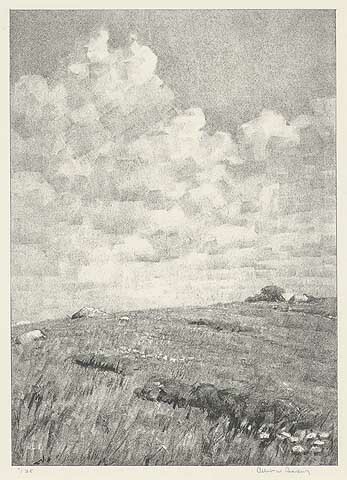 The clouds reach and fill the outer limits of the print’s image, and with subtle gradation, his grassy hills stretch out in an unyielding expanse. 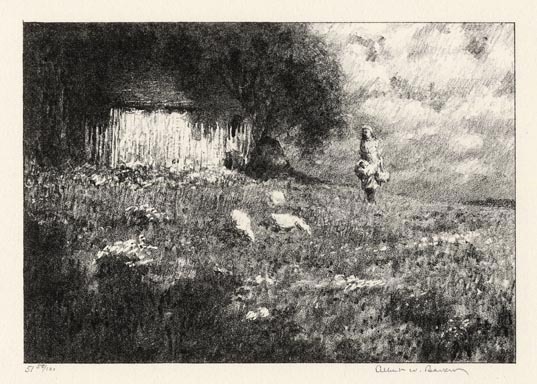 Printing in a sort of monochromatic realism, his farm scenes show the strenuous, yet quiet life of his neighboring farmers. 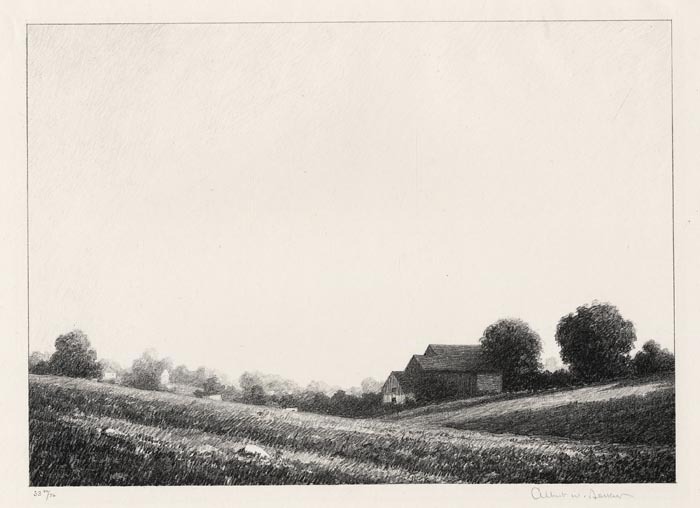 Barker’s prints are a tribute to the beauty of the Pennsylvanian landscape and the family farm in a time when he saw both slipping away, threatened by industrialization and the financial choke hold of the Depression. 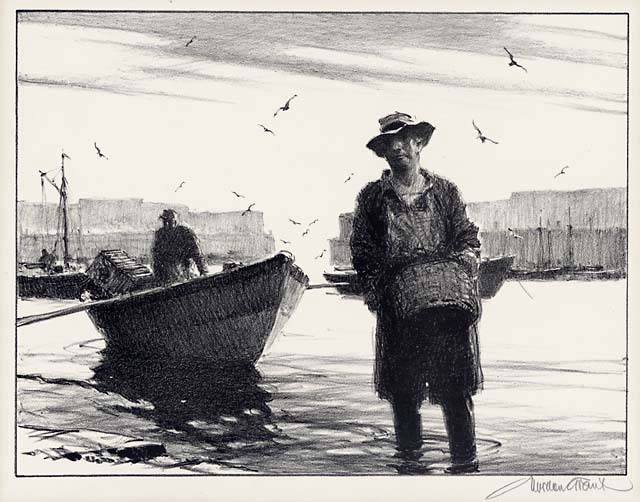 Click here to see all available lithographs and original charcoals by Barker, currently in our gallery inventory. Landscape (untitled). Albert W. Barker. 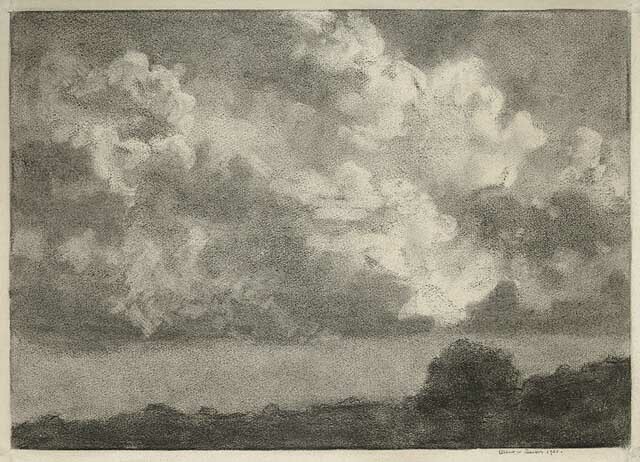 Charcoal drawing, 1905. Image size 13 7/8 x 9 1/2″ (353 x 243 mm). LINK. 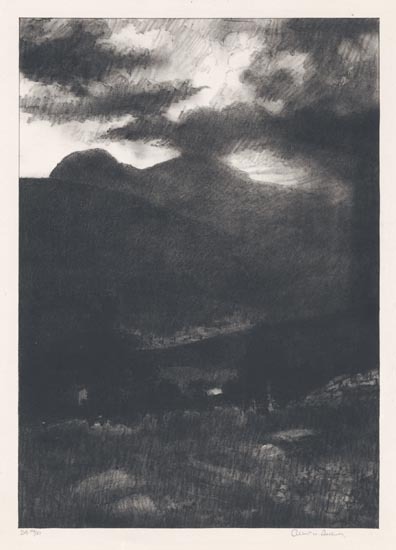 Catskill Mountains, Nightfall. Albert W. Barker. Lithograph, c.1928. Image size 10 15/16 x 7 3/4″ (278 x 197 mm). Edition 51. LINK. The Upper Meadow. Albert W. Barker. 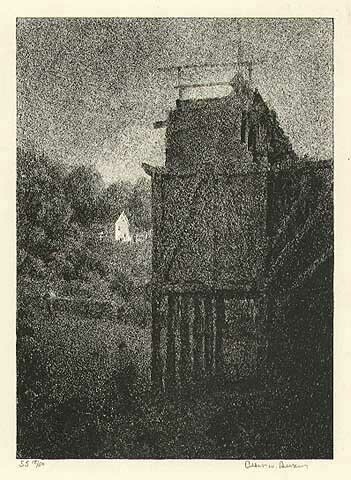 Lithograph, 1929. 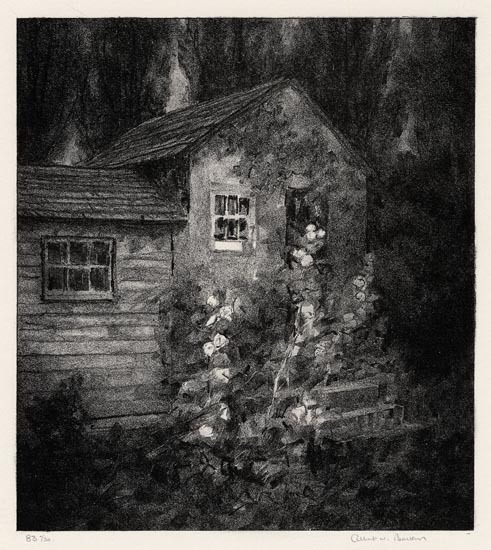 Image size 7 13/16 x 11″ (199 x 278 mm). Edition 76. LINK. Young Maples. Albert W. Barker. Lithograph, c.1929. Image size 10 13/16 x 7 3/8″ (275 x 182 mm). Edition 50. LINK. The Stone Crusher. Albert W. Barker. Lithograph, 1930. 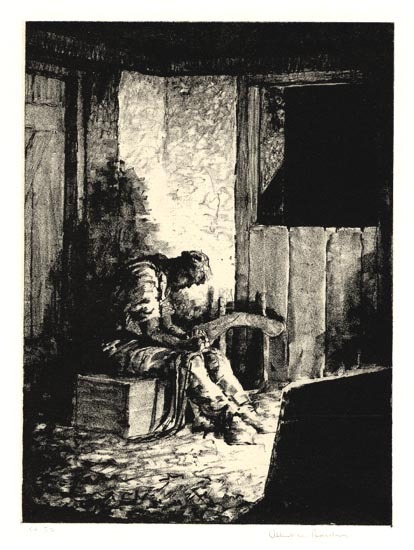 Image size 7 x 5″ (177 x 127 mm). Edition 50. LINK. The Barn. Albert W. Barker. Lithograph, 1930. Image size 8 x 7 3/16″ (203 x 182 mm). Edition 35. LINK. The Outlying Farm. Albert W. Barker. Lithograph, 1930. Image size 4 3/4 x 6 7/8″ (120 x 144 mm). Edition 100. LINK. 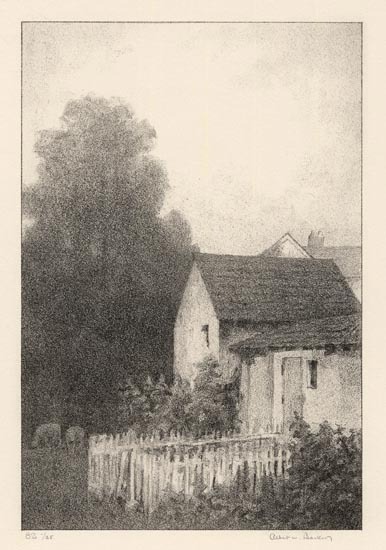 The Sheep-house. Albert W. Barker. Lithograph, 1931. Image size 9 13/16 x 6 9/16″ (250 x 167 mm). Edition 35. Inscribed in stone lower right indistinctly “A. W. B.” LINK. Stony Pasture. Albert W. Barker. Lithograph, 1931. Image size 11 x 7 7/8″ (279 x 199 mm). Edition 35. LINK. The Shop. Albert W. Barker. Lithograph, 1931. Image size 9 3/4 x 8 11/16″ (247 x 220 mm). Edition 30. LINK. 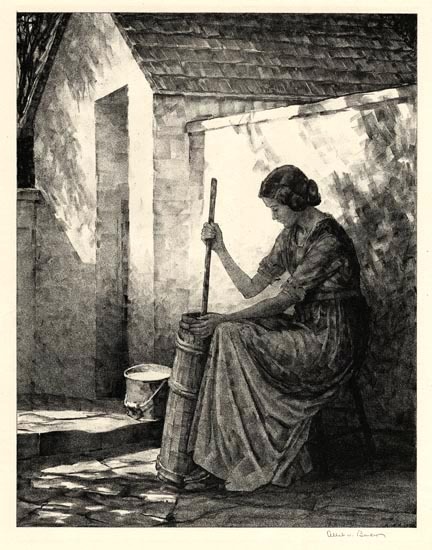 Churning. Albert W. Barker. Lithograph, 1932. Image size 13 7/16 x 10 7/16″ (341 x 265 mm). Edition 40. Inscribed in stone lower right “A.W.B. 1932.” LINK. In the Day’s Work. Albert W. Barker. Lithograph, c.1934. Image size 8 1/8 x 6″ (206 x 152 mm). Edition 59. Printed on chine colle. LINK. Stubble Fire. Albert W. Barker. Lithograph, 1935. Image size 8 9/16 x 11 1/16″ (217 x 293 mm). Edition 32. Printed on chine colle. LINK. Tenant House. Albert W. Barker. Lithograph, 1937. Image size 4 5/16 x 6″ (110 x 152 mm). Edition 50. Printed on chine colle. LINK. The Enchanted Meadow. Albert W. Barker. 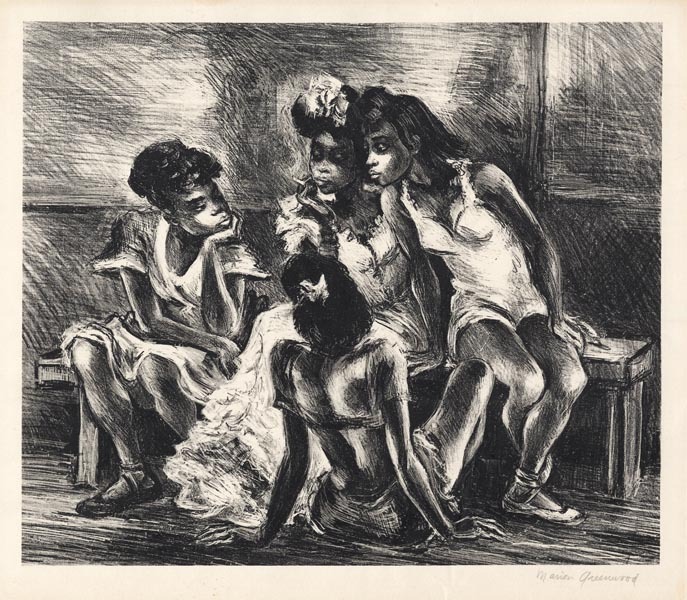 Lithograph, date unknown. Image size 6 3/4 x 9 13/16″ (172 x 250 mm). Edition 70. Some impressions printed in sepia ink. LINK. Here are our picks for the abstract admirer, who is drawn to artwork which takes some liberties, altering color and form to free itself from objective context. Reshaping the natural world for expressive purposes, abstract art is created through the suggestive strokes of the monotype brush and free line of the etching needle. The abstract admirer revels in the freedom of shifting interpretations, seeing and feeling new things every time they look at their print. See our gift suggestions, taken from our early 20th century and contemporary collection, for the abstract admirer. Enjoy! Sea Anemones. By Joan Krash. 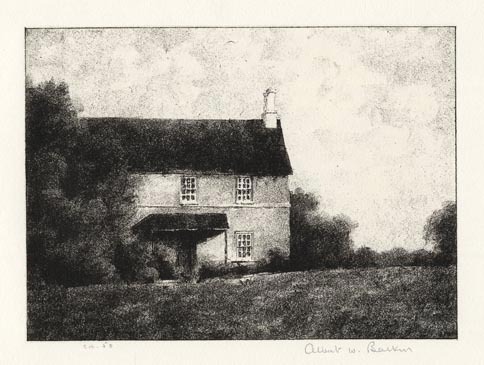 Solarplate etching, monoprint on Rives BFK paper, 2010. Inscribed “monoprint.” Framed by artist. $275.00. Far. By Masaaki Noda. Silk screen, 1986. Inscribed “85/98.” $300.00. All sales can be made in store or over the phone. We also ship prints and maps, flat and insured, using FedEx 3 Day Shipping. Our gallery hours are Tuesday-Saturday, from 10am to 5:20pm. The number at the gallery is (202) 965-1818.